I hate to write this post. In fact, I hate to think about this subject. But I'd be remiss if I didn't mention it. I needed to lose some weight. Let me stop right there and say that I have great sympathy for those who need to lose a great deal of weight. I'm lucky: I've been fairly slender all of my adult life. I'm a small person. But I was not slender as a teenager. In fact, I weighed more at age 16 than I weighed as an adult nine months' pregnant. And no, I'm not exaggerating. I know that being overweight is no fun. Even for slender persons, though, sometimes the number on the scale creeps up. Maintaining a desirable weight is easier for some than others, but it requires attention from nearly all of us. I'd just stopped paying attention to how much I ate. My clothes had become uncomfortably snug. Meanwhile, I turned 50, and I knew that losing weight would soon become more difficult than it has been in the past. So as part of this month of taking care of myself, I got on the scale. There it stands in my bathroom, patiently waiting to be used. I'd been ignoring it. 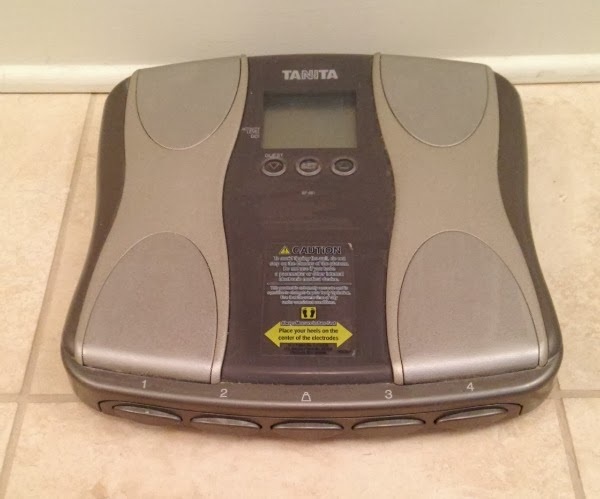 The truth is that I just didn't want to know what the scale said. Over the years I've discovered that I'm comfortable and healthy if my weight stays within a 10-pound range. If it goes below the bottom of that range (which hasn't happened very often), I'm a bit too thin. If it goes above the top number of that range, I'm too heavy. I've learned that obsessing about a particular weight is bad for me, body and soul. Using the ten-pound range as an indicator works better. As you can imagine, I discovered that the number was above the top of the range. So I did what I've been needing to do. I stopped eating so much, stepped up my exercising, and lost five pounds. It would be great if I could lose three or four more pounds, but at least now I'm back into good territory. Now I'd like to know about you. Do you struggle to maintain an ideal weight? If not, do you have any secrets? Do you weigh yourself regularly? Please share your experience! This post is the twenty-third entry in a 31-day series: Caring for Myself Body and Soul. I definitely see that it got harder when I hit 50. I'm slowly turning my thought processes and food choices around but it is way harder than I want it to be! I'd like to lose 10 pounds and stay within that same kind of range. I see pictures of myself and wonder who it is! Slowly I'm working on changes. Thanks for the encouragement! Shana, thank you so much for sharing your story. Congratulations on losing 30 pounds! I'm so glad to hear that you're on such a good track today. Weight control seems to plague so many women. I like to think that we can all encourage one another as we face our situations honestly. I am still carrying the "baby weight" and the baby will be 29 in December! My problem is I love food. My newest goal, since I can't exercise with a broken ankle, is to eat less, even half of what I would want to eat. We shall see! Wow, Valerie! A broken ankle?? I thought plantar fasciitis was bad! Bless you as you work to adjust your eating to fit your ability to move! I have struggled with my weight ever since I was in about the sixth grade I have had highs (about 20 years ago, in my 30's i was at my all time high...which was not a pretty sight. Probably about a year after our oldest son was born was my lowest...37 years ago. Through the years I have always struggled but after losing about 70 lb in the early 90's, I seem to have been able to keep it off....with more to go. I have accepted the fact that I will always struggle with this issue. I am healthy but will never be a thin person :( I see pics of myself when we first moved here to NC and I looked like Miss Piggy. I am thankful that at least I don't look like her anymore! Last year this time I was in the best shape and weight of my life. I am 53! I was able to run a half marathon 30 minutes faster than I did 10 years ago! I am still exercising but nowhere near where I was a year ago and my weight?, ugh, I have lost control. Just signed up for a 15K so I am hoping to be motivated to lose that extra 10 and your post definitely encouraged me. I know what I have to do but man oh man is it difficult. Good for you, much easier to loose 10# than 25# or more. My mom use to say "eat to live, don't live to eat" and I think that is a great thought. Happy new week! This is a great post, Richella. Congratulations on your success so far! . Our daughter got married in February, and I decided I would be mad at myself if I didn't try to lose the eight pounds that I felt I needed to lose before her wedding. I joined Weight Watchers for the accountability, and it worked well for me. But, five of those pounds have found their way back to my hips! I must get strict again about my discretionary points. I weigh myself almost every day.